A black and white negative of a Ford delivery truck that has been in an accident. View is of the driver's side of the truck. 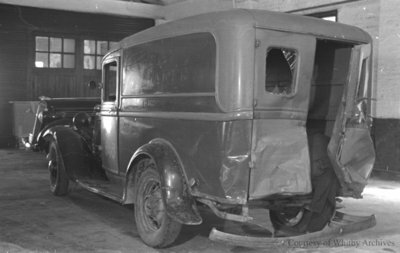 The truck is inside the garage at Whitby Motors Ltd.
Truck Wreck, June 10, 1937, Marjorie Ruddy. Whitby Archives A2013_040_202C.